It sounds an impossible challenge, but Ian Goldin does an impressive job combining clarity and conciseness in his Development: A Very Short Introduction, one of the well-known OUP series. The book seems to be a version of his longer book from a couple of years ago, The Pursuit of Development. Its six chapters cover: what it is, how it happens, why some countries are poor and others rich, aid, sustainable development, and globalization. The book manages to give a reasonable capsule description of the debates among economists and some sense of how development economics has changed over time. It studiously avoids reacinh strong conclusions on the efficacy of aid, this being a rather factual chapter. There’s a useful list of further reading at the end. I think someone knowing more or less nothing about the subject would come away with a rounded overview and the capacity – and interest, probably – to read more. I like the pay-off too: “Development is not simply or mainly about the lives of others. It is about ourselves and what we care about. Development is about who we are and our collective future. My quibble would be that the charts aren’t all that illuminating and only partly because they’re in black & white. Maybe all charts from now on should be left to Max Roser and his team at Our World in Data. 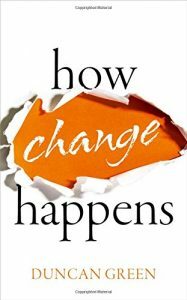 Anybody who reads Duncan Green’s excellent blog, From Poverty to Power, won’t be entirely surprised by the approach he takes in his equally excellent new book, How Change Happens. It is based on two pillars. 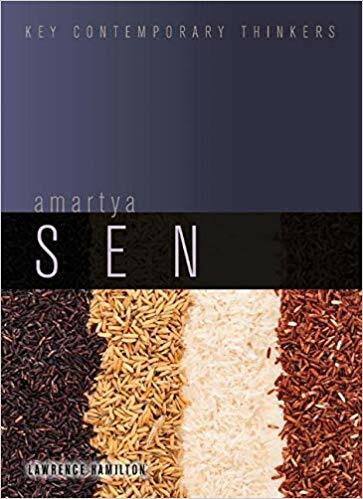 One is Amartya Sen’s capabilities approach to human development (‘the freedoms to do and to be’), and I’ve always thought that when you appreciate its ethical and practical merits, it’s hard to take any other approach. The other is the need for systems thinking when it comes to considering economic policies or other interventions – in any context, really, but certainly in the case of development. “Change in complex systems occurs in slow steady processes such as demographic shifts, and in sudden, unforseeable jumps,” Green writes. Mostly, change is extremely, painfully slow. It turns out to be impossible to do one thing because another, linked thing gets in the way. Events and crises open the way for the big shifts – being an economist, I think of this in terms of what it takes to move a co-operative game to a new focal point. But even then, the direction of the jump is contingent, messy, unpredictable. It anyway depends on the prevailing climate of ideas and norms – so part of the challenge is to be ready to take advantage of a crisis by having done all the contextual spade work, all the while getting on with the day job of trying to bring about incremental changes in the previous state of affairs. Needless to say, this does not make for a concise ten-point plan in the final chapter (although it does try to sum up the whole in a ‘power and systems approach’ in the final few pages). The book has some interesting practical ideas, however. I like the principle of looking for ‘positive deviance’ – look for examples of people or activities that succeed against enormous odds, for outliers, and use them as ‘social proof’ so others copy whatever it is. This is exactly the way new technological innovations spread: the ideas are there, a few people try, and others imitate them. There are loads of examples of advocacy and development organisations and initiatives that have been able to implement responsive, adaptable changes (many of these brought Tim Harford’s Adapt to mind). Other suggestions are harder to see how to implement. The book argues that principled leadership matters. I agree. But where is it? How do donors encourage it? Green concludes that many organisations in the aid world, including his own, need to move away from linear thinking and get wiser to context and the whole complex environment (actual and political) in which they operate. I hope they follow his advice and this book is certainly well worth anyone working in this world reading. The one element missing, though, seems to be the meta-analysis of the development agency ecosystem itself, and the prevailing ideas. For example, how do you get social innovation akin to technological innovation in a world of impact assessment and RCTs? Or indeed combine fleetness of foot with a genuine need to understand ‘what works’? Understanding one’s own cognitive biases or limitations is a tall order. What’s more, the aid world has incentive structures built in that will discourage change. In a variation on the old lightbulb joke (How many psyhologists does it take to change a lightbulb? Only one, but the lightbulb has to really want to change), how change happens is that a lot of people have to want change to happen. Anyway, there’s no excuse for not reading the book, as it’s also published as an open access pdf. I hope lots of activists read and digest and change their approach, but suspect it will prove difficult for many.